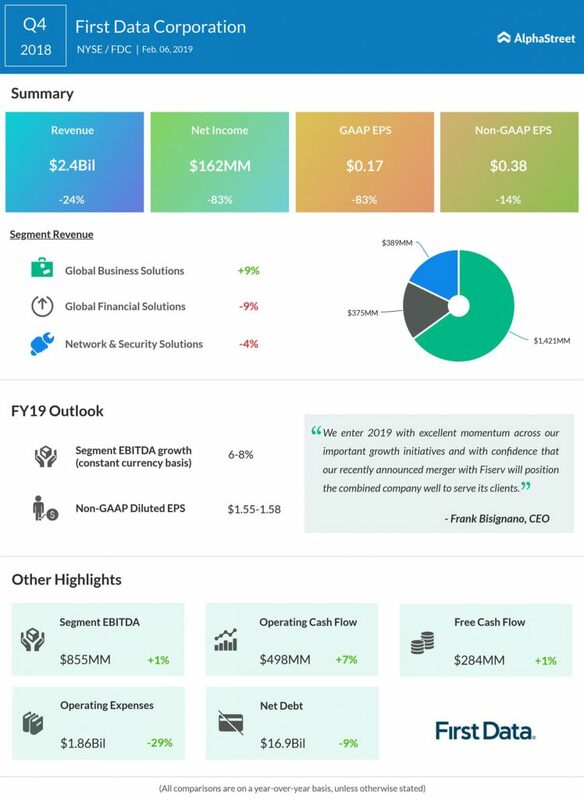 Fintech giant First Data Corporation (NYSE: FDC) reported better-than-expected Q4 results helped by solid performance from its Global Business Solutions division. The company’s stock has increased marginally in the pre-market hours after the earnings announcement. Due to the impending acquisition with Fiserv (NASDAQ: FISV), the company will not conduct a conference call with analysts. On January 16, 2019, First Data announced that it’s entering into a merger agreement with its rival Fiserv (NASDAQ: FISV) in an all-stock deal worth $22 billion. The combined entity is expected to bring in $900 million in cost savings and revenue synergies are forecasted at $500 million. Subject to regulatory approvals, the deal is expected to be closed in the latter half of 2019. First Data’s investors have been upbeat about the deal with the stock increasing 22% from the time the merger news broke out. The company’s revenue decreased 24% to $2.39 billion over last year. However, excluding reimbursable items, top line grew 3% to $2.19 billion. Adjusted earnings decreased 14% to $0.38 over last year hurt due to the normalized tax rate and currency impacts. For the Q4 period, analysts were expecting adjusted earnings of $0.37 per share and $2.18 billion in sales. Despite the top and bottom line results were down over prior year period, the company surpassed analyst estimates. Last quarter, the company’s earnings failed to beat estimates sending the stock down 9% post the announcement. However, revenue surpassed analyst consensus. On a constant currency basis, segment revenues improved 6% driven mainly by Global Business Solutions and Global Financial Solutions. The company saw 7% growth in segment EBITDA, on a constant currency basis, helped by improved earnings across all its divisions. First Data ended fiscal 2018 with long-term debt of $16.42 billion, down 8.4% compared to last year and its net debt reduced by 9.2% to $16.9 billion. Even though the company has brought down the debt levels, it’s still very high and has been a concern for investors. High debt levels put a dent on the free cash flow of a company, restraining it to do share buybacks and increase spending on research and development. It would be interesting to see with the impending Fiserv merger, how the company is going to bring down the debt levels in the near future. Related: Will the stock market be fair to Square? The company has announced its outlook for fiscal 2019 period. In addition, the forecast doesn’t include the recently announced Fiserv deal. 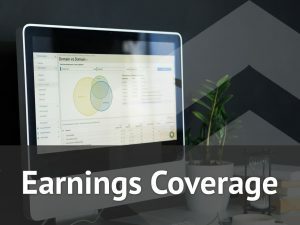 On an adjusted basis, earnings is expected to be in the range of $1.55 to $1.58 per share and segment EBITDA to improve between 6% to 8% on a constant currency basis. In addition, First Data also alerted that its fiscal 2019 performance would be impacted by divestitures done in 2018 and currency headwinds. First Data’s stock has been having a dream run in the bourses. Last year, the company saw its share price jumping 56%, and this year with the merger deal announcement, it has increased by 50%.